In fact, the ‘IoT’ is already here. It may still be in its infancy, but that Nest thermostat on your wall? That’s IoT. And the Fitbit activity tracker on your wrist? That’s IoT. A recent report suggests that total spending on IoT will climb from $69.5 billion in 2015 to $263 billion in 2020. This is due to the expected number of inter-connected devices rising from 4.9 billion in 2015 to 25 billion by 2020. In other words, IoT is going to be a large part of our lives. We’re proud to have already invested in some awesome IoT startups, like Teddy the Guardian – the cute baby-monitoring teddy bear, Krak – the social network for skateboarders empowered by an inconspicuous hardware, and Winnow Solutions – the food waste “smart meter” helping their customers save money and the environment. As the scene continues to grow, we expect to talk with many more IoT startups in the near future. In an attempt to help strengthen the London and Cambridge IoT ecosystems, we’ve partnered with Tech City UK to support the IoT Launchpad. We’ll be providing suitable Launchpad winners with match-funding, business support and mentorship. We’ll be announcing more partners nearer the event and will have more details about the many fun things we have planned for the weekend! IoT is an incredibly exciting area because the scope for its application is so varied. So whether you’re developing a home-automation app or are 3D-printing a prototype, Seedhack’s technology partners and expert mentors will be on hand to help make it happen. We’re moving into an exciting era of inter-connected devices. But what will it look like? Apply to Seedhack and help shape the future of IoT! Seedhack is Seedcamp’s annual hackathon, held at Campus London. 2015’s theme is Internet of Things. Seedhack will run during the weekend of 23-25th January 2015. Apply by 13th January 2015 to join the fun! On November 8-10, we had the pleasure of holding the 4th Seedhack – our biggest and most successful Seedhack ever. This year’s theme was ‘remixing content’ and attracted 100 hackers to join us for a weekend full of pizza, Redbull and hacking. Some of the brightest talents of the startup community from 17 countries showed up to take on the Seedhack 4.0 challenge, culminating in 16 hacks presented at the final demo day. Using APIs provided by our partners for the event; BBC News Labs, EyeEm, Imagga, Facebook, Getty Images, Google, HarperCollins, Nokia, Thomson Reuters and Stupeflix – hackers were challenged to produce innovative products, all to be presented on stage only 60 hours later. Located at Google Campus, the event kicked off Friday evening with inspiring talks by a number of corporates and startups. Gareth Capon, Product Development Manager at BSkyB, Ramzi Rizk, Co-Founder of EyeEm, Vinay Solanki, Strategy & Business Development Director, EMEA of Getty Images and Matt Shearer Innovation Manager at BBC News Labs shared their views on the challenging opportunities in the world of content. In another format, Nick Perrett, Group Director, Strategy and Digital from HarperCollins brought two authors (James Smythes and John Rogers) on stage with him and showed innovative ways of remixing their content. API presentations by the partners rounded off the formal presentations for the evening. Over stacks of pizza, beer and Mari wine (good stuff), hackers mingled and exchanged ideas. After the Dominos-sponsored pizza fest, hackers pitched their ideas and quickly formed teams. And then, the real work could begin! After a long night of hacking, teams kicked off day two bright and early with a gourmet breakfast – fuel for the long day of hacking ahead. In the afternoon, we invited mentors from Google, Twitter, Facebook, BSkyB, and others, as well as business angels to join and help the teams with their ideas. Throughout the day our various API partners were also present to support the hackers with API integrations. Teams worked day and night to finalize their projects. Highlights of Saturday were a lottery, beer pong and the magic hands of Simon the Shiatsu Massager, who took care of the hackers. After a Bitcoin mining mafia attack, an electricity blackout and loud german techno music, the teams worked all night to finish their hacks in time. On Sunday, teams presented their hacks to a crowd of over 100 people, a high calibre jury, and 160 viewers on the Seedhack livestream! The results were impressive. Fueled by endless cups of coffee, a fridge full of Redbull, and tasty catering throughout the entire weekend, the hackers turned 60 hours into 16 impressive new startups. The winners received Star Trek Enterprise Pizza cutter, a Playstation 4 sponsored by Getty Images and phones sponsored by Nokia UK. HACK YEAH! Our team was truly impressed by the energy of the teams and would like to thank everybody who was involved over the weekend. We would also like to thank our sponsors who made the event possible: BSkyB, Domain.me, Facebook, Getty Images, Rackspace. We would also like to thank HarperCollins for sponsoring the drinks on Friday and Uber London for driving our hackers home safely and Twilio for their credits. Find out more about their hack here. Watch their video here and get the app in the store here. In November we are hosting the 4th version of Seedhack at our headquarter Campus in the heart of London’s Tech City. Our past Seedhacks have focused on Fintech, and Fashion and ecommerce. This hackathon will run through the whole weekend from November 8-10th and is dedicated to remixing content. Seedhack vers. 4.0 is focusing on how disruption could be caused in the space of user generated content. With an increasing amount of music uploaded, photos shared, videos watched and checkins made, problems and constraints are often found when remixing content. We are seeking to tackle this problem! For everyone who has not attended one of our hackathons before, we are offering all participants help on creating hacks by providing a load of APIs, mentors and inspiring talks throughout the event. We would like to invite you to be part of an exciting weekend where we are planning to create outside the box hacks, disruptive ideas, innovations, cool and fun products. If you already have an idea – great! If you don’t – not to worry, you will meet many inspiring and talented people that will get your imagination going, and the ‘what if?’ questions flowing. We are looking for developers, however people with UX design, marketers, biz dev, and creative minds to get involved. On the API front we are planning to have numerous partners and we are open to bring in APIs varying from music to photo. Keep an eye on the Seedhack Twitter account for more API announcements, including a few big names that we think you may have heard of! Updates will follow. At the end of an exhausting weekend full of coding, pizza and energy drinks you’ve got the chance to present your hacks on stage and get feedback from our high class judges (TBA soon). The winning teams will get not only fame but fun awards. Stay tuned! In order to get the optimal ratio of skills to form good and strong teams, we ask you to fill out this form, and express your interest in the topic. We would love to have everyone, however we do have limited space, so please make sure you stand out in the application form to get a space! We will let you know by the 25th October if you are one of the participants in Seedhack November 2013. Interested in getting involved on an API or sponsor level, please give us a shout! This weekend, over 100 hackers came down to Campus in London for Seedhack with only one goal; to disrupt fashion and online retail. After a long weekend of prototyping, building, presenting (and getting through a fridge full of Red Bull and a huge stack of pizzas); twenty one new startups came to life. We would like to thank our sponsors who made the event possible: HarperCollins, Net-A-Porter, M&S, Domain.Me and the Seedcamp sponsors supporting this event: PayPal and Yammer. We would also like to thank Rackspace for sponsoring the drinks on Thursday. Friday kicked off with three great keynote speeches from Nick Perrett (Group Director, Strategy and Digital at HarperCollins Publishers), Nick Cust (Director of ECommerce at NET-A-PORTER.COM) and Devin Hunt (CPO / cofounder at Lyst) who provided a lot of inspiration to the participants. They were followed by API speakers from HarperCollins, ASOS, Google, Net-A-Porter, Imagga and Paypal who explained how their technology could be used in the projects (most of the final projects included at least one of the technologies presented) and an introduction to Lean Canvas by Jon Gold. The queue to pitch ideas stretched to the back of the room, quickly teams were formed and the real work could begin. After working late into the night on Friday, the teams were back in action early in the morning on Saturday with some even running to Oxford Street to talk to customers to validate their ideas from the night before. Saturday afternoon brought another great set of mentors to Campus which helped the teams with their business and API questions. After another late night, Sunday was spent putting the final touches on the products and presentations and, by 3pm, 21 new startups had been formed; a record number for Seedhack. The judges were very impressed by the quality of the projects and how much had been achieved in such a short time but were given the difficult task of selecting an overall winner and four runners-up. We would like to thank the judges: Carlos E. Espinal, Tom Montgomery, Jon Gold, Johanna Kollmann and Simon Cast. Each member of the winning team received an awesome prize, but we were so impressed that we also extended an invitation to attend Seedcamp Berlin in May to the winner. Relist – The global marketplace of excess luxury fashion for both off-price (professional) fashion buyers and boutiques/designers. Team: Sara Gordon, Ivan Mazour, Gianluca Trombetta, Manu Matute and Laurence Greenberg. Checkout Anywhere – Affiliate platform for publishers to sell products featured within editorial content using responsive checkout widgets. Fashion Intern – A Facebook game to crowdsource fashion metadata. Colourtag Me – Use colour analysis to find clothes that will suit. Team: Jessica Healy, Alastair Lee, Barry Macmahon, Mart Karu and Kaido Treial. Chip-in.me – Helps co-ordinate group purchases. CrowdFit – Increases ecommerce sales conversion rates, decreases ecommerce return rates. The Fashion Intern – A Facebook game to crowdsource fashion metadata. Snoop – Snoop will find out when your items go on sale, so you don’t have to. CheckoutAnywhere – Affiliate platform for publishers to sell products featured within editorial content using responsive checkout widgets. Shop via Command Line (BRANDiD Engineering Team) – Shop via Command Line is the easiest way for developers to order their clothing from BRANDiD. The Fitting Boutique – Provides one-stop shop to individual customers to create their own retail experience and to free them from the stress of dealing with delivery and returns. StyleVote – Stylevote helps fashion retailers to produce more of what customers want and less of what they don’t by involving them in the pre-production process. CatwalkWear – Matching catwalk looks with high street items. My Perfect Fit – We match your body measurement to the individual garment measurements to recommend you the right size to buy. TAB.IT – TAB.IT makes shopping easy. No more messy open pages! Tango Studio – Helping fashion brands to create more styles that customer love to buy by involving them during the range creation process. Pinsur – Product discovery that offers unique range of ethnic fashion products from brands around the world. Rentez-Vous – Rentez-Vous allows girls to rent clothes to each others and unlocks the hidden value of their clothes for an accessible and sustainable fashion. Fashion Combined – Connects retailers and consumers around the hottest products, and those that the retailers most want to sell. Automated platform using Retailer data to put products in front of consumers in an easy to use and intuitive format. Photoshoot – We enable people to share what they’re wearing and build fashion conversations based on location, occasion and time. ManBag – Saving men from the high street. Allowing women to shop till they drop. A huge thanks again to everyone who participated this weekend, we are already looking forward to the next edition of Seedhack which is planned for later this year. As we get closer and closer to the 3rd edition of Seedhack, our very own hackathon, we would like to start rolling out the excitement that has been going around Campus for the past few days. We’ve been putting all the pieces together and preparing everything to the last detail to set the stage for three days of full-time hacking. The whole event takes place at Campus London. On Thursday evening we’ve invited the selected participants to come meet each other over casual drinks and start coming up with ideas. The real event will kick off on Friday evening where we will have some great speakers and API presentations followed by a full weekend of hacking. On Sunday afternoon the teams will have the chance to present what they have been working on to the audience and a panel of top judges. Our gratitude goes to the Seedhack sponsors who are making the whole event possible: HarperCollins, Net-A-Porter, Marks & Spencer, Domain.Me and Yammer. We also have some great mentors coming to help the teams work on their ideas including experienced mentors from the Seedcamp network and from companies such as Amazon, ASOS, HarperCollins, Net-A-Porter, and Seedcamp teams such as BRANDiD, Nuji and Poq Studio. We would also like to thank Rackspace who will be providing the drinks on Thursday evening. Last March we held the 2nd edition of our Seedhack hackathon where we brought together top-notch hackers with big players from the financial services industry to create innovative solutions in FinTech. The results of Seedhack FinTech surpassed our expectations and motivated us to keep on going. We’re excited to announce that we’re back with the third Seedhack on the 8th, 9th and 10th of February and again we’re ready for disruption! This time the hacking will focus on fashion and online retail as we are seeing a lot of innovation in this area and are sure the teams will start building some great companies over the weekend. The Seedcamp Family already includes disruptive teams in these areas such as EDITD, BRANDiD, Nuji, Poq Studio, Sayduck and ERPLY who will be sharing their knowledge and experience at the event. We’re bringing together many more big and innovative players from the fashion and online retail industries to speak, provide their APIs and help hone ideas to jumpstart the projects so keep an eye out for further announcements coming soon. As you might have read on TechCrunch recently, hackathons are a great testing ground to get ready for pitching VCs. Seedhack’s goal is building new companies so a great place test your ideas and turn them into viable companies over a weekend. The idea behind Seedhack is to create new companies. As such, we are looking for people to come up with ideas over the weekend, rather than pitching an existing company’s idea. All roles are needed to build a successful company so we’re not just looking for developers but also for designers, marketeers, product managers and biz dev folks to enable the startups to be formed. The whole event is free and open to anyone interested in hacking fashion and online retail. We do however need to make sure that we have the correct ratio of skills so you can complete this form to express your interest in attending. We’d love to have everyone attend but unfortunately space is very limited so sign ups will be accommodated on a first-come-first-served basis. If we can’t accommodate you, we’ll let you know over email as we approach the date. Thursday, 7th of February: in the evening we will have a casual social get together for participants to meet before the event and start brainstorming ideas. Friday, 8th of February: Seedhack will start with a talk, API presentations and then team formation. As soon as teams have been created, everyone is free to start working on their ideas. Saturday, 9th of February: mentors will be around to answer business and API related questions and to provide feedback and guidance to your projects. Sunday, 10th of February: will be our presentation event where all companies will showcase their efforts. Are you a brilliant hacker with a penchant for showing off your skills, but no ideas? Maybe you’re from a company with a real industry problem that has hit a wall? Or perhaps you’re a business person interested in fashion or online retail? If you answered yes to any of the above, then you need to register here for Seedhack and start thinking of ideas! Any existing companies interested in being involved as mentors, sponsors or providing their API can get in touch with us here. Today we’re launching version 2.0 of the Seedhack Founder’s Collaboration Agreement (download here in .DOC or in .PDF). We’ve made a couple of adjustments to the previous version that we hope will further make this document a solid tool to help launch an informal collaborating team into a formal company. One thing we’ve added is a Vesting Schedule to the existing reverse vesting clause. We’ve had a few questions on what this should look like (a simple table can suffice) and so offer up a template to help get collaborators started. Reverse vesting in general and bad leaver/good leaver clauses in particular are topics we get asked about a lot by entrepreneurs. In basic terms, reverse vesting aligns the amount of time a founder puts into a company with the amount of equity that founder can walk away with at certain date by holding the founder’s shares in escrow and releasing them over time, typically over three to four years. In the beginning, when an idea is fresh and a team is quickly gaining momentum, reverse vesting may seem unfair or irrelevant. But a number of circumstances may arise down the road that can shake up a founding team. For example, a founder may need to take a break from the entrepreneurial lifestyle to pursue more regular employment due to cash needs. Or a founder might decide to focus on a different startup – a particularly common occurrence after events like hackathons where talent and ideas are essentially speed dating and a founder may face multiple startup opportunities. Or, simply, the founders might just not get along and decide to move on. Whatever the reason, founders do sometimes need to leave and when this happens, reverse vesting all of a sudden is a very useful and fair tool. For a good primer and additional reading on reverse vesting, the benefits to founders to include vesting from the start, and what to expect down the road, check out this post by Dave Broadwin via Simeon Simeonov’s blog, or this one by Dan Shapiro. 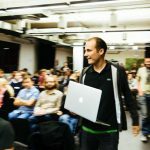 Also check out Fred Destin’s presentation at Seedcamp Ljubljana on the Startup Lifecycle for more information on how reverse vesting is founder friendly, as well as other great insights for budding startups. We’ve also included in version 2.0 a broad non-compete clause. The intent here is to protect the startup by preventing the development of a competing technology by one or more collaborators should they decide not to move forward with the team. A thank you to Phil Weiss for this language. Another big thank you to Tina Baker from Brown Rudnick for drafting the original agreement. The spirit of the doc remains the same – a starting point for discussion – and can be used as is or modified to suit the founding team’s needs. Thanks again for all your comments on version 1 and we look forward to hearing your thoughts on v2.0. This work is licensed under a Creative Commons Attribution-NonCommercial-ShareAlike 3.0 Unported License. Based on a work at www.seedhack.com. Permissions beyond the scope of this license may be available at http://www.seedhack.com. Both Seedcamp and Brown Rudnick LLP expressly disclaim any and all responsibility and/or liability for any loss or damage whatsoever arising out of or in connection with acts or matters done or omitted to be done in reliance upon any document, information or opinion contained on this website. The documents, information and opinions on this website have been prepared for general informational purposes only, may not reflect the most current market and legal developments and may not address all relevant business or legal issues; accordingly, such information is not promised or guaranteed to be correct or complete. Further, the documents, information and opinions on this website do not, nor are they intended to (a) constitute legal advice, (b) create an attorney-client relationship or (c) be advertising or a solicitation of any type. You should not rely upon any documents, information and opinions on this website for any purpose without seeking legal advice from licensed attorneys in the relevant jurisdiction as each situation is highly fact specific and requires a knowledge of relevant laws. Certain parts of this site link to external internet sites, and other external internet sites may link to this website. Neither Seedcamp nor Brown Rudnick LLP is responsible for the content of any external internet sites.